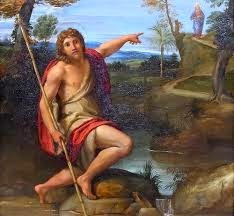 Thank you for your thoughts on "pointing to Jesus" and your link to the series on John the Baptist in art. It was very enlightening. Your writings always awaken me again. Thank you. Back when I was preaching, sometimes people would say they were glad to see me or hear me…..or glad for one thing or another in my ministry. I tried always to respond that I hoped that when they saw me that I was pointing to Jesus…… I still hope that.